Don: Among the synoptic gospels, there are slight differences in the story in which Jesus rebuked money changers for plying their trade in the temple. For instance, John puts it near the end of Jesus’s ministry while the others put it near the beginning. To me, this and other minor discrepancies are unimportant; what is important, is the meaning in the story. Many visited the temple to make a sacrifice, to atone for their sins. Some were pilgrims from afar. The type of sacrifice offered depended on the wealth of the supplicant. The rich could afford a whole ox, the middle-income folks might afford a sheep, while doves were all the poor could hope to afford. Rather than go to the trouble of bringing animals with them, many purchased animals at the temple, where merchants sold them at extortionate prices. It was a seller’s market. 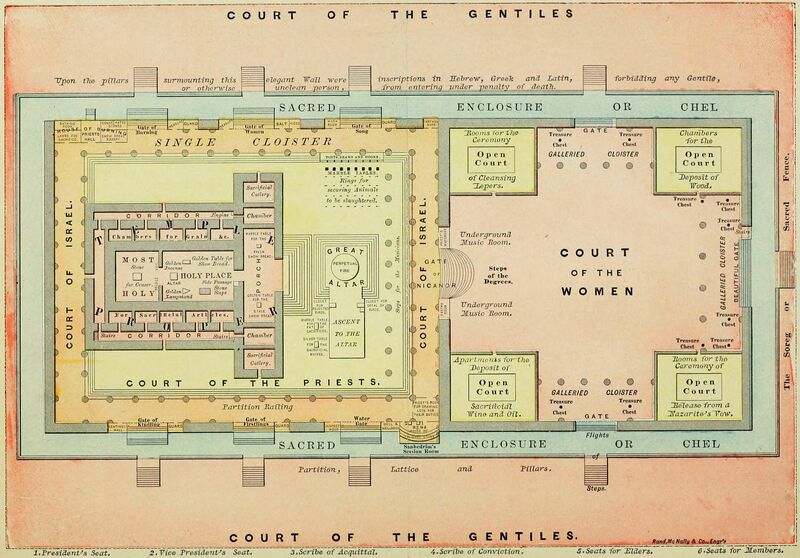 The temple only accepted payment and contributions in its own special currency, so visitors first had to change their Roman currency at the money changers’ tables, which were in the outer court, the Court of the Gentiles. The money changers of course charged a profitable and perhaps extortionate percentage for doing the transaction. Jesus established the unequivocal principle that God is the God of all Mankind, and that where God is, everyone is welcome. But there may be still more to the story. It was placed (in John) between the story of the wedding at Canaan (where unadulterated new wine was preferred to contaminated and diluted old wine) and the story of Nicodemus being born again (where the jaded old life was replaced by a pure new life). Perhaps this placement was deliberate, intended to make the point that the ministry of Jesus was about to replace the old ways of worship with the new. The allusion to the destruction of the old temple (which took 46 years to build, remember) and the building of a new one in only three days was to show that the old temple and its ways (including ritual sacrifice) were to be replaced by the sacrifice of the body of Jesus, to be resurrected in just three days as the new temple of worship. The true house of God is a place for all people. There are no divisions, no concentric courts, within it. Jesus’s extraordinary actions in the temple reflect this hatred of a divided, unjust, and unrighteous house purporting to be God’s. Does worship today still tend to segregate, actively and/or passively? How can we ensure it is linked to justice in the sense of “and equal worship for all”? Does the story call us to violence to achieve this goal? Does it authorize violence as an appropriate response to injustice? How militant may we be? Anonymous: I don’t think God wants militancy. Justice must come from a merciful, not from a militant, heart. An impure, unrighteous heart cannot dispense justice, and its worship is unacceptable to God. Donald: Was Jesus angry, militant, or just frustrated in this story? It is certainly not a side of Jesus we see elsewhere in Scripture, where he is nothing but loving. Love and anger don’t seem compatible. In the modern idiom, we would say that Jesus “lost it” or “had a meltdown”—he lost his temper. But it is uncomfortable to apply language like that to Christ. Don: The story certainly leaves an impression of anger and intolerance and, indeed, militancy in Jesus. Owen: Would “passionate” be a more apt word to describe his behavior? It’s not necessarily the same as rage. Jay: His actions are obviously important to the story. To most human observers, the overturning of tables and threats to beat people with a rope might seem more than an expression of passion. Be that as it may, Christ’s behavior in this one event is in stark contrast to his behavior before and after in his ministry. Indeed, immediately following this event he went on to heal people. I think this contrast, and above all the reason for it, is what we are intended to reflect upon. Donald: Jesus was out of character. This is a righteous zeal, to be invoked whenever God’s holiness is challenged, whenever He is degraded. It was not personal in the human sense—Jesus was invariably loving and merciful to people—but it was personal in the divine sense. It directly concerned the Father and his holiness. His behavior was designed to draw attention to this, and it succeeded. Kiran: But Jesus apparently deplored Peter’s zealous violence against Malchus’s ear in the garden of Gethsemane. With Man, violence begets ever greater retribution, in a vicious cycle. But God died—through Jesus—in order to break this cycle. It is in the very nature of Jesus to renounce violence. In this story, he was upset because the temple and its ways were a stumbling block to those truly seeking God. The temple’s idea of holiness as ceremonial sacrifice and so on, was not God’s idea of holiness as service to one’s fellow Wo/Man. Jay: Jesus certainly viewed the behavior of the money changers as barriers to the establishment of worshipers’ relationship with God. He was not concerned about their greed and cheating. He was not concerned about the mindset of the worshiper in believing he needed to sacrifice an animal. But he was concerned that nothing should get in the way of the worshiper’s relationship with God. We might call his response to the money changers’ egregious behavior “un-Christ-like” but I think it’s more important to dwell on the causes of his behavior, as opposed to the behavior itself. His words on the subject of the unpardonable sin were also exceptionally strong, and the subject was the same as the one addressed in his behavior in the temple—which was, admittedly, the behavior of someone who had “lost it,” who had “freaked out.” The stakes, he surely must have felt, could not be higher. He was dealing with spiritual life and death. Owen: It seems significant too that this was happening in the most important temple of all. He had dealt with liars and cheats on other occasions (Zaccheus the tax collector, for example) but not in a setting like this one. Here was God’s house, yet people seemed oblivious to its desecration. They had grown used to it and were desensitized to it. But not Jesus. He was shocked and horrified, and clearly felt the they needed to be shaken awake to what was happening. Jay: The sin of Zaccheus clearly was different from the sin of the money changers, to have elicited such a different reaction. Owen: Zaccheus did not interfere with people’s worship and he was not a proud man, unlike the holier-than-thou priests and merchants of the temple. Donald: The temple was conducting what everyone at that time (except Jesus) would have considered business as normal. If they had known the Messiah was coming to visit, they probably would not have done anything different. We ourselves expect God to be happy with what he sees happening in our own church. Jay: That would account for Christ’s anger. Their “business as usual” was 100 percent diametrically opposite to what it should have been. Jay: …and he would probably have found unconscionable venality; sufficient to cause true worshipers to stumble. They put personal profit ahead of the needs of people wanting to connect with God. David: If Christ is going to “lose it” over human venality, he’d better stay away. I hear us all struggling to apologize for what is, in my mind unquestionably, Christ’s un-Christian behavior! The message of the story (“Don’t be a stumbling block”) is a good Christian message, but its manner of delivery was not that of someone we expect to turn the other cheek. The manner—upturned tables, the threat (possibly the act) of scourging—was violent, and violence is a matter of degree in practice but not in principle. In principle, lashing out with a scourge at people who don’t share your beliefs in God is as bad as driving a truck into a crowd of people you believe to be infidels. Both are acts of terrorism. The only excuse for Jesus is his humanity, as opposed to his divinity. And if we are to judge him as a human being, then we have no choice but to find him guilty. Owen: It seems wrong, but it cannot have been wrong, otherwise there would be no meaning in his sacrifice and resurrection. “The Lord shall never be willing to forgive” the person who worships falsely. Donald: How could we know whether Jesus was upset with the heart or with the behavior of the money changers? Owen: He was angry not at the extortion nor even the blasphemy; he was angry because they were causing true worshipers to stumble. Kiran: For one thing, their extortionate prices would have prevented some people (of whom some would have made a once-in-a-lifetime pilgrimage) from buying the sacrificial animals they felt essential to help them in their relationship with God. Jay: Perhaps Christ was attacking not the wicked individuals but the iniquitous system. David: I doubt that Jesus cared one whit about systems. His loving care, so far as I can tell from Scripture, centered solely on individuals. And so, in the case at hand, did his fury. Terrorists strike indiscriminately and impersonally for what they think is “the greater good.” Jesus taught that when struck we should turn the other cheek. The only possible explanation for this disorienting dissonance, it seems to me, is that Jesus was caught in a moment of humanity, as (again, it seems to me) he was when he wept at news of the death of Lazarus, and when he cried out in anguish on the cross, thinking he had been abandoned by God. Don: Clearly, we need to work on this. My question is: Did Jesus flail a whip, yet not strike anyone? He turned over tables. Did he knock down a person? Was it to drive out the animals? I was raised by the paddle. My grandma had only to pick it up and we all would be so shocked that we instantly stopped whatever undesirable behavior. This was our “Cookie Grandma”. She didn’t walk around with the paddle in her apron pocket. Yet, it had to be serious for her to pick up that small Fli-Back paddle. I cannot recall even one instance where she actually had to follow through. We loved her absolutely no less. But, we knew she had a line we should not cross. Just my naughty childhood memory and my further questioning. At work, someone thinks I ask too many!